With the kids away last weekend at my folks it meant consecutive days on the water. And that’s a good thing even in the midst of yet another cold front (albeit mild) which would provide for a challenge and a diminished bite. However, what lacked in quantity was made up for with a pair of quality bites. No Hot Sauce? – Slept in a little later than normal on a fishing morning so I opted for a fast food breakfast instead of making my own. I was looking forward to a Super Sonic Burrito from the local Sonic even though probably not the best for me. Particularly appealing is the inclusion of a batch of jalapenos in these breakfast creations. Throw in some hot sauce and it’s a great start to the morning. Well, good on the jalapenos but disappointed when the lady at the window informed that they’d ran out of hot sauce. 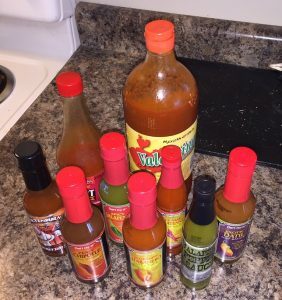 Boy, what kind of spot runs out of hot sauce? Certainly not my house as noted by my current collection below. Weather You Like it or Not – Wind gusts that made it a chore to row, water that numbed the fingers when pulling up the anchor and 40 degree starting temps…hey, what’s new for 2018? 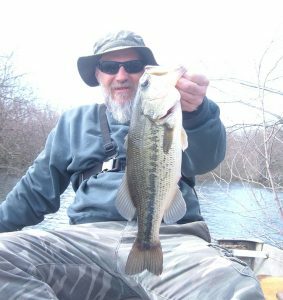 As I struggled to get bit, I Iapsed into that whole blame the weather routine that us anglers have been known to employ as a reason for not fooling the fish. That’s right, reason, not excuse. Been doing this for a long time, I know the semantics. At any rate, as I replayed bits from the four previous trips alongside the current weather I realized that I had not had a decent day to go fishing all year. In fact, I would have to say that my bonus February 27 outing was actually the “nicest” day. And there was still ice on a quarter of the lake. Been an ugly 2018, sure hope Spring shows up before Summer. Shad Rap – This old bait saved the shutout again after I struggled to get a bite on several other presentations. I really don’t know what it is about this unassuming, quiet bait but run at a slow crank, just enough to keep it in a tight wobble, it is a winner when looking for a cold water bite or two. I’ve got a pile of stuff in my “Legendary Lure” series of writings over the years and this one is bucking for inclusion. One of these days I also want to go off on a tangent about this bait that I bought in the 80s as it begs for a melding of tunes and tackle. After all, its cool name brings to mind an exposure to the musical genre that included the likes of Kool Mo Dee, Kurtis Blow, Grandmaster Flash, Whodini, Run DMC and The Sugarhill Gang. Top Bass – The KVD crankbait came through on an old faithful sort of spot that was getting hit by the east wind. Not my preferred direction but proves that wind can still be a winner in positioning some fish. 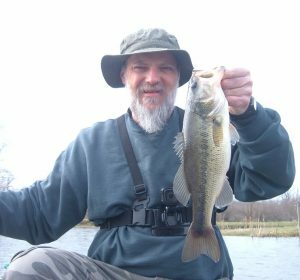 This fish came minutes after I’d relocated to a second lake and had me thinking that perhaps I had found some interested bass. I hit a number of similar setups but only got one more bite the rest of the way. The whole “wind from the east” saying was right on target again.